› Author Affiliations Funding This effort was fully funded by ECRI Institute. Background Outpatient providers often do not receive discharge summaries from acute care providers prior to follow-up visits. These outpatient providers may use the after-visit summaries (AVS) that are given to patients to obtain clinical information. 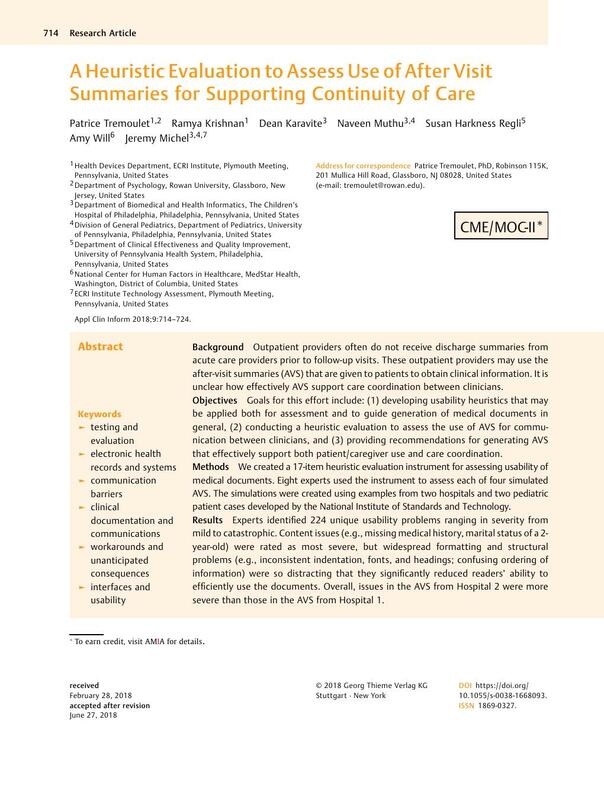 It is unclear how effectively AVS support care coordination between clinicians. Objectives Goals for this effort include: (1) developing usability heuristics that may be applied both for assessment and to guide generation of medical documents in general, (2) conducting a heuristic evaluation to assess the use of AVS for communication between clinicians, and (3) providing recommendations for generating AVS that effectively support both patient/caregiver use and care coordination. Methods We created a 17-item heuristic evaluation instrument for assessing usability of medical documents. Eight experts used the instrument to assess each of four simulated AVS. The simulations were created using examples from two hospitals and two pediatric patient cases developed by the National Institute of Standards and Technology. Results Experts identified 224 unique usability problems ranging in severity from mild to catastrophic. Content issues (e.g., missing medical history, marital status of a 2-year-old) were rated as most severe, but widespread formatting and structural problems (e.g., inconsistent indentation, fonts, and headings; confusing ordering of information) were so distracting that they significantly reduced readers' ability to efficiently use the documents. Overall, issues in the AVS from Hospital 2 were more severe than those in the AVS from Hospital 1. Conclusion The new instrument allowed for quick, inexpensive evaluations of AVS. Usability issues such as unnecessary information, poor organization, missing information, and inconsistent formatting make it hard for patients, caregivers, and clinicians to use the AVS. The heuristics in the new instrument may be used as guidance to adapt electronic health record systems so that they generate more useful and usable medical documents. This study was performed in compliance with the World Medical Association Declaration of Helsinki on Ethical Principles for Medical Research Involving Human Subjects and was reviewed by ECRI's Institutional Review Board.